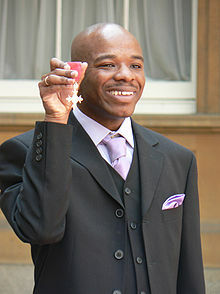 Stephen Wiltshire MBE (born 24 April 1974) is a British architectural artist. He is known for being able to draw from memory a landscape after seeing it just once. His work has gained worldwide popularity. In 2006, he was made a Member of the Order of the British Empire (MBE) for services to art. He opened a gallery on the Royal Opera Arcade in London in 2007. Wiltshire was born in London, England. His father was from Barbados. His mother is from Saint Lucia. He has autism. Wikimedia Commons has media related to Stephen Wiltshire. ↑ "Stephen Wiltshire". Image Me Image You. Retrieved 7 December 2017. This page was last changed on 7 December 2017, at 15:03.